William Frederick Hafner founded his first toy company in 1901 in Chicago, Il., to produce clockwork toys. The original factory was located at 9 S. Canal Street. In the beginning, his company - the Toy Auto Company - focused on the production of clockwork automobiles. Hafner's creations reflected the advances in technology during those years, and clockwork mechanisms became the consistent component in all the pieces he manufactured. But the company struggled with the production and distribution of its products. In 1904, the name was changed to the W.F. Hafner Company and Bill Crawford was brought on as a partner. Hafner produced clockwork trains from 1905-07. Early trains were hand painted with die-cast locomotives and tinplate rolling stock. Eventually lithograhic processes were employed and hand painting ceased. Facing mounting financial troubles Hafner entered into a partnership in 1910 with William Coleman, a Chicago hardware store owner, to start American Flyer. They focused the business on the production of clockwork trains. In 1914 Hafner left American Flyer to reform his company and produce lithographed trains. The Hafner Manufacturing Company was a maker of clockwork-powered 'O' gauge toy trains, based in Chicago, Illinois, from 1914 to 1951. The first trains were ready for the Christmas season of 1914. Everything was new. Nothing was brought over from Flyer. There were no patents. During its peak periods, Hafner Manufacturing employed as many as 150 people. 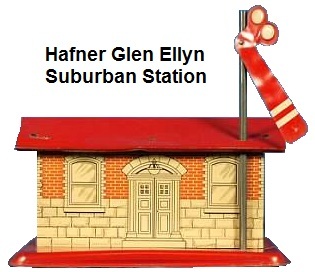 In addition to manufacturing the toy trains, over the years, Hafner also made a stake truck, a runabout, a toy lawn swing, and even metal lawn chairs. He also designed a clockwork motor. The reasons for William Hafner departing American Flyer, a company he helped found, are lost to history. In the book Greenberg's Guide to American Flyer Prewar 'O' Gauge, author Alan R. Schuweiler cites three possibilities: Hafner may not have known what position he held in the company, he may have sought a larger share of the company, and he may have been passed over in favor of his co-founder's son, William Ogden Coleman, Jr. The importation of German toys was banned in the United States during World War I and this created the opportunity for Hafner to establish a foothold in the marketplace. 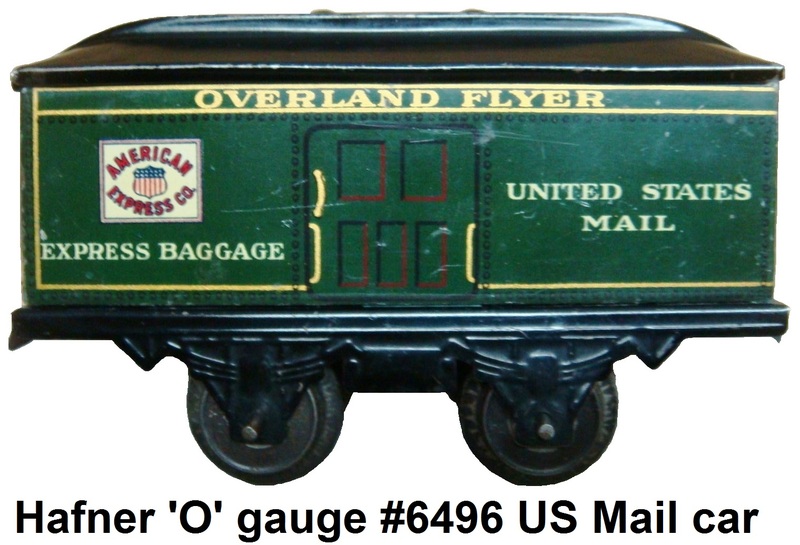 While Hafner was able to quickly gain distribution from catalog retailer G. Sommers & Co., it never received the widespread distribution of the so-called "Big Four" of American Flyer, Lionel, Dorfan, and Ives. 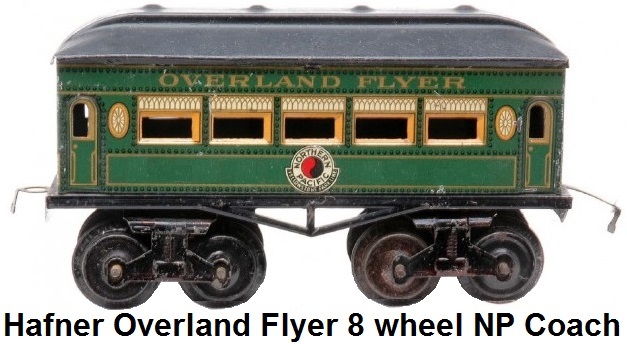 The early Hafner trains bore the Overland Flyer brand and closely resembled competing offerings from American Flyer's #1100-#1200 car series. As late as 1917 a car appeared in American Flyer's product line that closely resembled a Hafner design. The two companies did not work together in these early days. It is more likely that one or both companies copied designs from each other freely, as Hafner may have actually created the original designs when he worked at American Flyer, and patents for the designs were rarely filed in those times. It is also believed that both Hafner and American flyer may have purchased rolling stock from German competitor Bing, which would explain similar products in each of their lines. It is possible that American Flyer also purchased from Hafner, or vice versa. 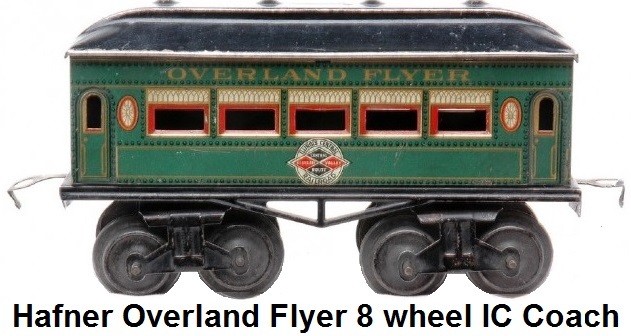 In addition to the Overland Flyer designation, there are commonly found Hafner trains bearing New York Flyer, Canadian Flyer, and Sunshine Special markings. 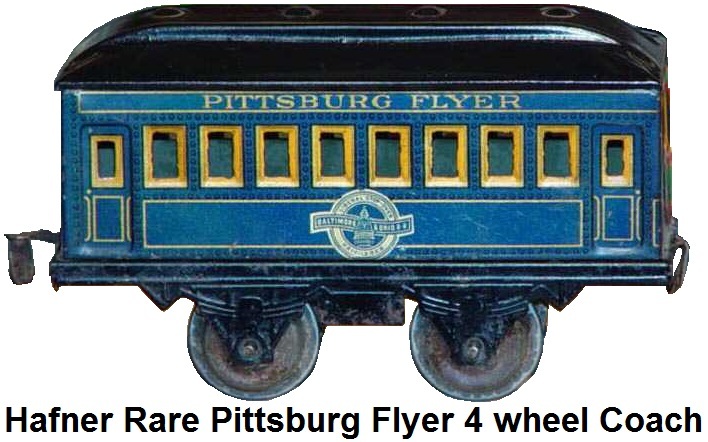 In recent years a rare lone 4 wheel Hafner passenger car marked Pittsburg Flyer was sold at auction for $3,888.91. This was the highest known price to ever be paid for a Hafner 4 wheel car. The car also bore a Baltimore & Ohio RR hearld. It is beleived that this unique car was part of a set of 4 wheel cars made for a sales man to utilize for marketing purposes or was perhaps made as a special request by a store company like Gimbels or Kaufman in Pennsylvania. This unusal find has spurred collectors to seek out additonal such Hafner rarities. The majority of passenger cars and freight cars made by Hafner were of the 4 wheel type - one on each corner of the car, with no swiveling trucks. However, there were five different Hafner 8 wheel cars with swiveling 4 wheel trucks that were made. These cars are also considered to be very rare, and normally sell for large sums, if located today. 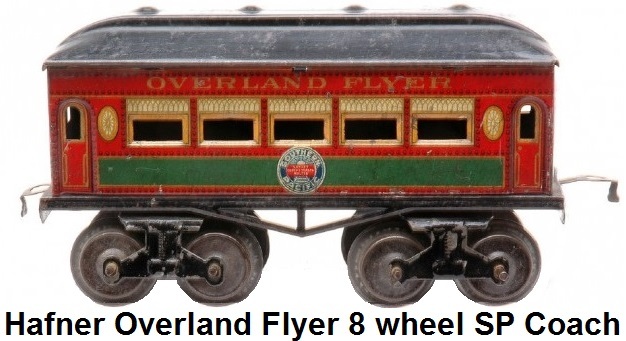 The 8 wheel cars were the Wells Fargo baggage, Union Pacicific, Southern Pacific, Northern Pacific, and Illinois Central coaches, all with Overland Flyer markings. Hafner tended to not place catalog or identifying numbers on its passenger car bodies. It did however print them on the freight cars. Most often found are six digit numerals on either side or on one end. 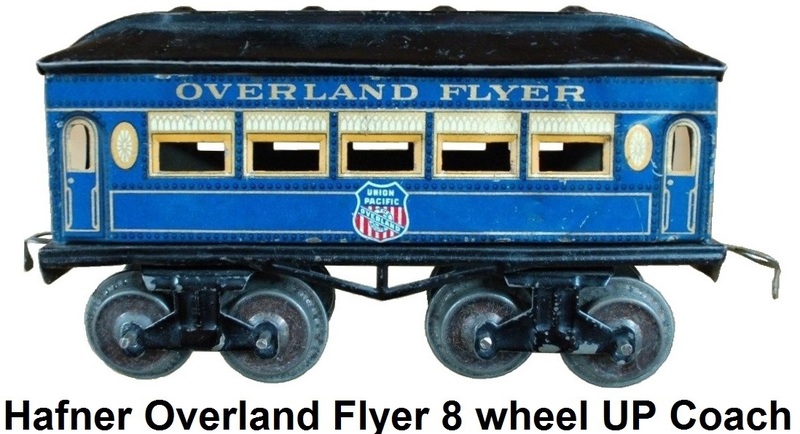 Most of the Hafner cars were put together from 4 separate pieces of tinplate, and had a square end construction up until the streamlined rounded designs appeared in the mid-1930's. An exception was the early one-piece passenger car that resembled the American Flyer Hummer style coach. These simple cars had no visible markings on the end's for doors or vestibules, and were used in the less expensive sets. The early cars were 5� inches long, except for the 8 wheel cars, which were 6� inches. 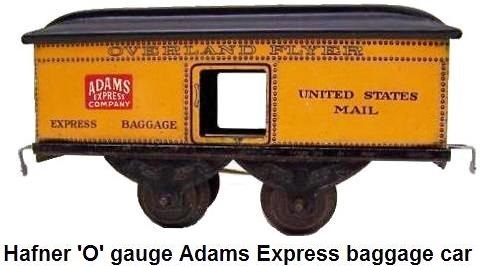 Passenger train offerings consisted of baggage/mail cars, pullman type coaches and an observation car with a rear platform. Freight trains consisted of the Peerless stock car, Santa Fe box car, NYC sand and gravel car and a Chicago & Northwestern caboose. All freight cars came in multiple color combinations, but the heralds never changed. Unlike its competitors, Hafner survived the Great Depression without making significant changes to its product line, since it always specialized in inexpensive train sets that sold for US $3 or less. From 1920 to 1930, locomotives were mostly castiron steam types of conventional outline until the late 1920's or early 1930's, when sheet-metal steamers of conventional outline were introduced. In 1933, to commemorate Chicago's "Century of Progress" Exposition, Hafner created the Century of Progress Special set. This set consisted of a clockwork 0-4-0 loco, 4 wheel tender, a 4 wheel mail car, a 4 wheel pullman and a 4 wheel observation car. It featured an operating battery powered headlight with switch on the loco, and an operating red light on the rear platform of the observation car. The loco also was equipped with a ringing bell, simulated drive rods, a brake lever and hand rails. Included were 10 pieces of track and a crossover, making a figure 8 layout. The complete set sold for $1.39 retail. Upon seeing the new streamlined prototypes displayed at the 1933 Chicago "Century of Progress" Exposition, Hafner decided to start making and selling a new line of streamlined models. Hafner made an articulated diesel streamliner of the Union Pacific "City" type which was issued at about the same time as the prototype. Two major versions of the M10000 were made. Early versions utilized a pin on the top of the vestibule ends to connect the cars. These proved to be too problematic as frequent accidental uncoupling when traversing rough track occurred. The models were then modified to have a better coupling via a floor extension and a longer pin. Models of slant-nose Zephyrs, such as the Flying Yankee, came out in 1937. The Hafner streamliners were good looking models and were very popular. Production of Hafner streamliners ceased with the outbreak of WWII. The War also proved to be a greater challenge for Hafner sales in general. Since toy production was prohibited after 1942, toy companies had to adapt. While Lionel and the A. C. Gilbert Company were able to secure government contracts to manufacture items with military applications, Hafner lacked the tooling and manufacturing expertise to do the same. Hafner survived by forming a symbiotic relationship with the Fox Brewing Company. Fox was unable to secure bottlecaps from any other source, while Hafner was unable to make much else. Over the years, the outlines of the Hafner locomotives changed considerably as threy evolved from the early cast-iron, through various sheetmetal types, but the basic clockwork mechanism used in these trains changed very little. It is possible to repair a pre-1918 mechanism with parts from a model of the late 1940's. The springs, gears, governors, escapements and keys are interchangeable, with no known exceptions. There were changes however in the sideplates, wheels, siderods and mode of securing the mechanism into the loco bodies. Many pieces of early Hafner rolling stock and locomotives bore the same #1010. 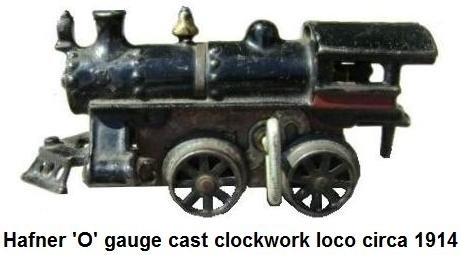 The #1010 loco first appeared in 1938. It was explained many years later by William Hafner's son John in a 1968 interview that 1010 was the address of the company's Chicago factory - 1010 North Kolmar Avenue. John Hafner took over the company in 1933, but William Hafner stayed involved with the company until his death in 1944. Hafner's son John took over completely in 1944 and ran the company until 1951 when he sold it to All Metal Products Company, of Wyandotte, Mi and New York, NY. In a 1992 interview, John Hafner said he was glad to get out of the business, citing increased difficulty competing with larger toy manufacturers. John Hafner passed away in 1993. All Metal Products Company was known as the makers of the Wyandotte brand of steel toy trucks and cars. They had been in the toy business since the early 1930's. For a brief period of time, the trains appeared with both the Hafner and Wyandotte names on them. This was because All Metal Products had obtained completed inventory that was already stamped in the acqusition. Once the left over stock was exhaussted, only the Wyandotte name appeared on the trains. For this reason, many of the same exact locomotives and cars appear with multiple combinations of names. Wyandotte also later cheapened the clockwork motor. All Metal Products continued to put out the lithographed stamped steel trains for a time under the Wyandotte name, but the company went bankrupt shortly after in 1956. Hafner's new ownership faced the same difficulties, and by 1956 was out of business and in liquidation. Louis Marx and Company purchased the Hafner tooling, then shipped it to its subsidiary in Mexico, where it was used to produce inexpensive windup and battery-powered sets. Many Marx collectors believe Louis Marx's primary motivation for the purchase was to eliminate a competitor from the marketplace. The clockwork locomotives and colorful lithographed tinplate rolling stock placed Hafner at the low end of the market. Unlike most of its competitors, Hafner never created an electric train. William Hafner believed that electric trains were too big and too expensive and therefore were not toys. He only wanted to make toys. Any Hafner electric trains that exist today were retrofitted with a motor from another manufacturer. Electrifying Hafner locomotives by outfitting them with surplus Marx electric motors is a somewhat common practice. Both Hafner and Marx were known to use "recycled" lithography, a cost-saving practice where the tinplate from defective print runs was flipped over and printed on the blank side and used. The result of this is hidden graphics on the interior of cars and accessories. In addition to re-using its own defective sheets, Hafner would sometimes buy defective sheets from other companies as scrap and use it. Some Hafner collectors specialize in collecting these variations. Additionally, some metal products from the mid-20th century such as flashlights have surfaced with Hafner lithography inside, which indicates that Hafner sold its surplus or unusable print runs for use in the manufacture of products that would be painted.